Description of "The Devil "
The Mumbai Underworld goes for a toss after Don Darampal is murdered. His brother Ramji tries to regain control from chaos, but he is pitted against the man they call the Devil. The story tells how men become monsters as they try to survive and establish complete dominance over the other. Vimal John KC is the author of the book Short Stories and Scripts related to crime and fiction genre in particular. Apart from being a writer, he enjoys directing short films. With a sense of humor he proclaims nobody else can relate to, he tries to be serious. Vimal resides in Karnataka and hopes to travel to London someday to watch a Test match at The Lord’s sipping English tea. 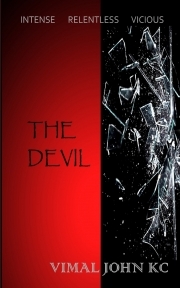 Reviews of "The Devil "
To call this book a nail biter would be an understatement, and thereby not giving it a full credit. It is more of a hair pulling, wall punching, table smashing story with high G forces experiencing pace to end with a thundering finale. An excellent read from a promising writer who has come along quite nicely from his first writing. This book is unusual from its title to its storyline. I gave it five stars because of the ending, which totally surprised me and you wont find it in similar novels.The characters are unique and fresh. And the best part is every scenario mentioned in the book seems realistic. I am from Bangalore and some things mentioned in the novel are familiar to me. I dont know how to write a review, so i am giving it a try. The book is about a corrupt police commissioner who wants to become the Don after killing the former Don. Reading this book is like watching a movie, it is as mentioned in a review, Intense. I don't know how to compare this book to any other I have read before, but it really is something unique.I usually don't read crime novels but I really liked this one! I did say in the title that if you like Indian authors, you will love this book. But the resemblance to popular authors like Chetan Bhagat ends with the use of simple words in writing. When it comes to the story, this book is in a league of its own. Its complex, intricate and it truly stands by the genre-"THRILLER". The story starts with the kidnapping of a medical student from a private university, If you read the PREVIEW of the complete first chapter provided above, you will know the amount of the twist and turns the author has managed to keep the reader guessing. There few books out there that carry forward the story with this pace of story telling and even fewer with an ending like this one. I thought I had the ending of the story figured out but I was pleasantly surprised how clueless i actually was. Watch out for the character called Ravi, he is something else. I wouldn't be surprised if this book gest a cult status, KUDOS. One of a kind thriller story by the author....The story is really good and full of suspense. It keeps you guessing till the end, which is the best part of the book. All the characters are well placed and well addressed.The best bet of the book is the ending and the very reason that keeps you glued to the book. Overall a fresh suspense fiction...Superb ending is the icing on the cake for me!!! The devil is a very misleading title for a book that by itself is all about it. The author has managed to create twenty unique chapters that can be made into twenty independent books thanks to it brilliant story line. When you read through the book, you cant help feel the blend of pulp fiction, Rock n Rolla and the dark humored films. But then again, what the author has going for him is the sheer pace of the story. With more than thirty men murdered each in a different manner and for different reasons, it is truly intense. But if you are to ask, what made me put this book in a unique shelf of its own is the ending and the sheer brilliance of the twentieth chapter. Brilliant !!! !